Oscar Wilde's play 'Salome' was first published in French in 1893. Almost immediately, Beardsley made this illustrative drawing speculatively and it was reproduced by line-block in the laudatory article about the artist which appeared in the first number of the new Studio Magazine published in April that year. On the strength of this design Wilde and his publisher John Lane commissioned Beardsley to make his celebrated set of illustrations for the English edition of 1894. Beardsley redrew this design for the book as 'The Climax', simplifying the forms and omitting the elaborate 'hairline' calligraphic flourishes that had characterised his earlier drawing style. The original drawing, to which he later and somewhat unsuccessfully added green watercolour washes, is now in Princeton University Library. This line-block print comes from a large group of reproductions of Beardsley's designs assembled in the 1890s by the art critic Gleeson White, an expert on book illustration and one of the artist's earliest suppoprters. 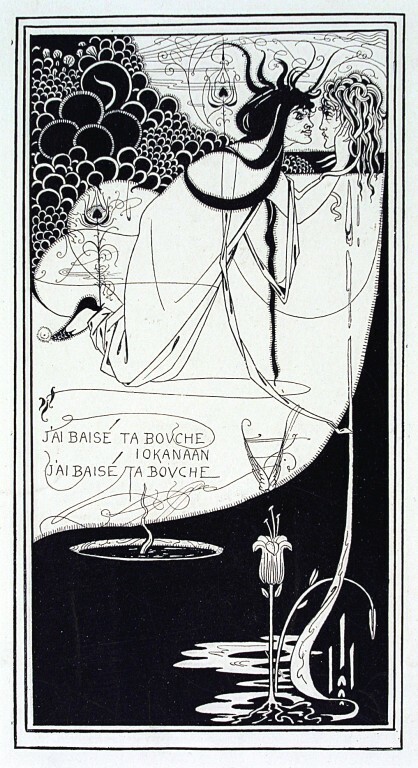 Line block print on Japanese vellum of 'J'ai baisé ta bouche Iokanaan', to illustrate Oscar Wilde's play 'Salome', redrawn as 'The Climax', depicting the levitating figure of Salome dressed in a white robe and with writhing snake-like curling black hair as she holds the severed head of John the Baptist (Jokanaan) complete with tendril-like hair and dripping blood. These drips form a puddle in the lower right hand corner of the design, from which a white lily grows statuesquely. In the top left hand corner of the image is a cluster of circular black and white objects, perhaps referencing the 'clusters of black grapes' to which Salome compares John's hair. There are decorative stylised peacock feather motifs adorning the white areas of the design. Handwritten text in French, halfway down the image on the left hand side. Oscar Wilde's play 'Salome' was first published in French in 1893. Beardsley made this illustrative drawing speculatively and it was reproduced by line-block in the first number of the Studio Magazine, in April 1893. On the strength of this design Wilde and his publisher John Lane commissioned Beardsley to make his celebrated set of illustrations for the English edition of 1894. Beardsley redrew this design for the book as 'The Climax', simplifying the forms and omitting the elaborate 'hairline' calligraphic flourishes that had characteried his earlier drawing style. The original drawing, to which he later and somewhat unsuccessfully added green watercolour washes, is now in Princeton University Library. This line-block print comes from a large group of reproductions of Beardsley's designs assembled in the 1890s by the art critic Gleeson White, an expert on book illustration and one of the artist's earliest suppoprters. 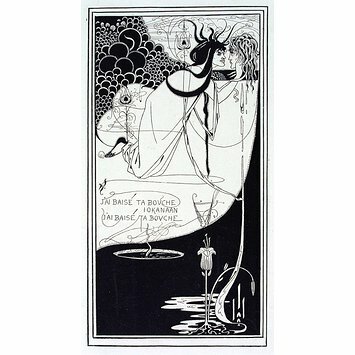 This image is one of 199 photo-process prints (E.358 to E.556-1899) of reproductions, chiefly proofs, of designs and illustrations by Aubrey Beardsley; and his portrait. Bought from Mrs A Gleeson White, 21st January 1899. Printed in 1893 and subsequently redrawn and printed in 1894 and 1907.